Indie-pop quartet Deep City headlined The Hunter Club for the very first time on Saturday evening, alongside some great support acts. The night kicked off with the hilariously brilliant sounds of Theo Morris And Not The Theo Morrises. Morris, previously a member of fabled band Janet Street Slaughter, has suddenly decided to make clones of himself to make up his backing band, which is a brilliant idea considering half of his songs are ‘poo-related’! A really enjoyable set to kick off the night. Next up was Sam Eagle and his backing band The Lemon Lizards with their jazz-influenced indie sounds. Though they closed on the crowd pleasing 15/8, the rest of the set was a mix of Eagle’s solo material from his EP’s like Bodies ,and a taste of new music which is set to be released very soon. And if that isn’t exciting enough, they are playing a live set on BBC 6 Music in the next few weeks! Sam Eagle is definitely a name to watch out for. After nearly a year away from Bury St Edmunds, Huckleberry Harrison‘s return to the local scene was welcomed with his super-suave performance of songs from his debut album What The Huck? featuring tracks like #1 Anime Dad and Not That Kinda Girl. Other highlights from his assuring set included Sheets Are White, debut single Dracula and new song End It This Way, which is hopefully getting a release soon because it really is brilliant. This set is easily one of our highlights of 2018. Before the headline act, soloist Kerry Devine entertained an appreciative crowd with tracks from her debut album Away From Mountains which was released only three weeks ago and a wonderful cover of a Portishead track. Her enchanting vocals were inch-perfect throughout, especially on the beautiful Fools That Fall. Devine did state that it’s “not a party album” and its definitely not like the tracks from side project The Baby Seals, but the songs are truly captivating and lovely to listen to. She finished her set on the upbeat swing of When I Get Low, I Get High. a track that she hadn’t performed for years! 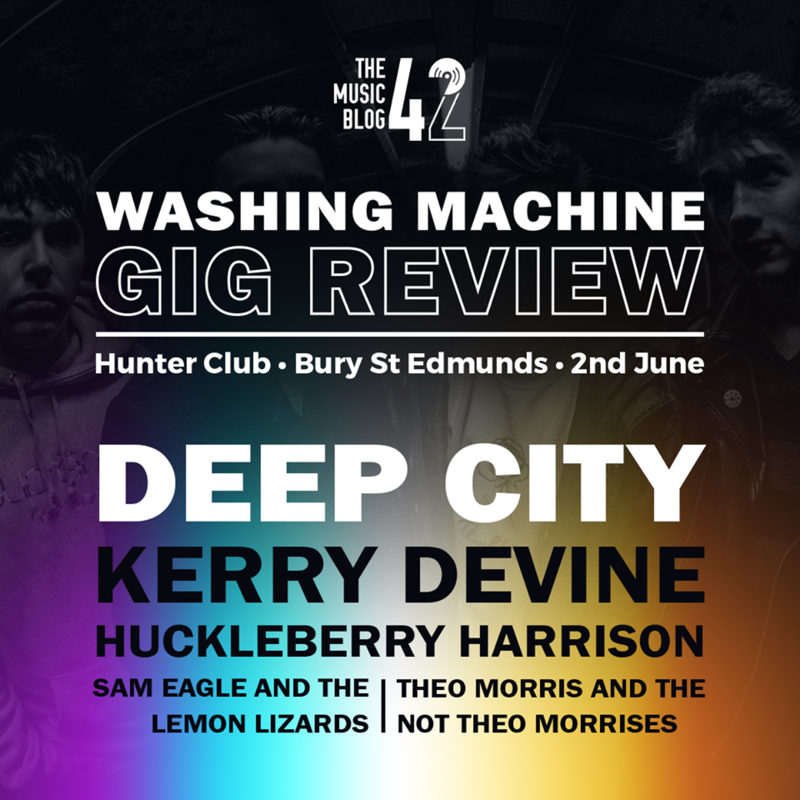 After years gigging around the local scene, Cambridge’s Deep City finally headlined their first Washing Machine and it’s fair to say it’s been long-awaited. The quartet played tracks from debut EP 15:16 including the utterly sublime L.O.V.E and Time, and older tracks like Plastic and Wht Hppnd which still hit home and sound so fresh. Technical problems did hinder the band towards the end of the set, however they overcame the difficulties with ease with a quality cover of Everything Everything’s The Wheel (Is Turning Now) and set closers Slow and Close Up. A really polished set from a band that just get better and better with every performance. The next Washing Machine is on Saturday 16th June featuring Tundra, Thy Last Drop, KYANOS and more! £5 entry, helping to raise money for Riverwalk School, 6pm kick off.